In line with UP ALCHEMES Inc.’s pursuance for academic excellence, the College Entrance Exam Review Series (CEERS) was conducted on August 5, 12, 19, 26 and September 2 in PACE Academy, Quezon City. The event aims to provide affordable and effective review materials and sessions to senior high school students for their upcoming college entrance examinations. Although discontinued for two years, CEERS had partnered up with PACE Academy to accomplish this project, a big step for a venture that is starting up again. The CEERS 2017 team, led by Maru Del Carmen as the overall Project Head, spent weeks of planning and preparation to ensure that the said event will be a success. The committees with the respective committee heads are as follows: Finance – Rizza Reodique, Logistics – Katherine Augusto, Publicity – Ayeesha Umali, Reviews & Tutorial – Spencer Go, and School Affairs – Kynan Taclobao. Schools offering various senior high school curriculum around Quezon City were invited to participate through email blasts, phone calls, and personal visitations. Review materials were restructured, and volunteers for tutors and marshals were called for. Eye-catching publicity materials were created, posted, and shared as reminders for senior high school students and as means for project exposure. Fundraising programs, procurement of materials, and budgeting were also handled, along with constant reminders and meetings online and in person. What’s special about CEERS is that the participants were not required to go to specific review centers, which can be time consuming and inconvenient. Instead, the review center was brought to the students by conducting it in their school, which, in hindsight, is comparable simply to adding another school day in a week. To be enlisted in this program, participants paid Php 350 for all five sessions, with a discount of Php 50 if the participant pays during the first collection of payments. This fee covered the inclusion of the CEERS 2017 Review Kit (handouts, review materials and basic materials needed for the entrance tests) and the transportation expenses of the tutors and marshals. The CEERS 2017 review sessions were held during the Saturdays of August. During these sessions, subjects commonly found in college entrance exams such as Mathematics, Science, Verbal Ability, and General Knowledge are taught comprehensively. Tutors and marshals were also able to inform and guide the participants in choosing the desired courses and careers that is aligned with their aptitudes and skillsets. The last day of CEERS was dedicated to the simulation exam, a four-hour close depiction of what may happen during the actual college entrance exams. Although these review sessions coincided with the first month of classes, busy schedules, and the late designation of committee heads, tutors and marshals were made sure to be there with the participants to push through with the tutorials. “One of the major hindrances [on organizing CEERS] was lack of availability of people, even the [steering committee], due to Saturday classes. Second, the team was formed slightly late since the [steering committee]’s first meeting was held only in June, and sessions started in August. Lastly was lack of actual experience and knowledge with the event since it was halted for two years,” said Maru Del Carmen, the CEERS Overall Project Head. “Even so, with all these factors, the team managed to rebuild the event, despite the not-so-high number of participants. We still pushed through because the whole point of CEERS is service, to our students and their future education. This year’s CEERS will serve as a foundation of further reshaping the event into its former title, alongside the major events of the organization,” Del Carmen added. The success of CEERS 2017 is a part of UP ALCHEMES strive to promote academic excellence and service not just confined in the organization but also to the community. Through CEERS, the organization hopes that the commitment to excellence will be instilled in these students’ minds and the knowledge imparted to them will be of use in attaining quality tertiary education. 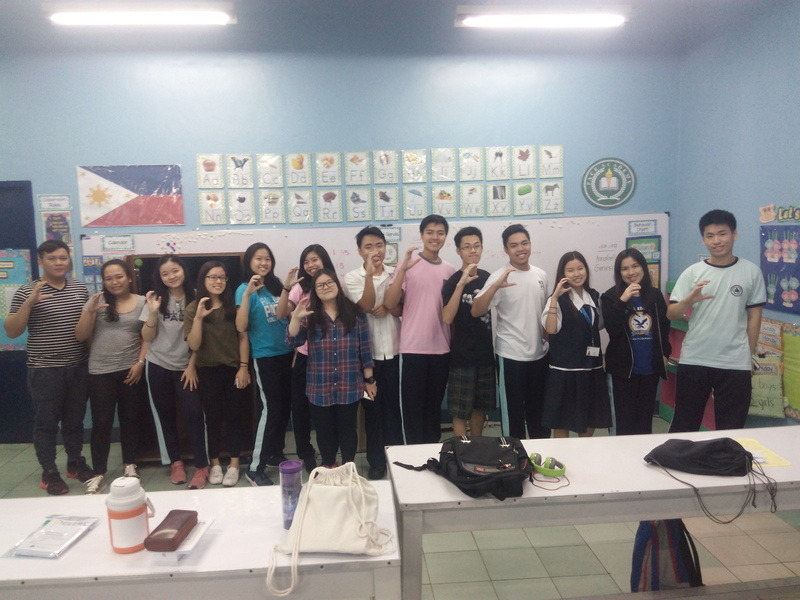 The CEERS pose as done by the to-be college entrance exam takers.